A beautiful Happy Easter ceramic kids mug that is personalised on the back with the child's name. Available with the option of a chocolate lollipop and gift wrap for an extra £1. This baby bib is available for any name. It is personalised with the name you provide. 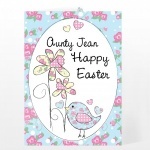 A personalised Easter greeting card.